In approximately 300 B.C., Eratosthenes, a Greek mathematician living in Alexandria, devised a method of calculating the circumference of the Earth and in doing so, provided evidence to support his long held belief that the Earth is a sphere. Eratosthenes reasoned that if two sticks of equal height are placed on the Earth’s surface and aligned with the direction of the Sun, then at any given point in time, assuming the Earth is flat, they will cast shadows of equal length. In other words, the angle between the sticks and rays of Sunlight would be the same. However, when he conducted an experiment with the help of friends in Assouan, he found that this was not so. In his experiment, sticks were placed vertically in the ground at Alexandria and at Assouan. At noon the angle made by the Sun’s rays and the top of the sticks was measured it was found that there was a difference of 7.2o between the two measurements. Now, Alexandria and Assouan lie on the same meridian of longitude and so noon always occurs at exactly the same instant in those places, which means that they must be in line with the direction of the Sun at that moment. He knew that Assouan lay due south of Alexandria at a distance of 580 statute miles. He reasoned that if the Earth were indeed a sphere, then a line drawn around its surface would describe a circle. Since there are 360o degrees in a circle and since 7.2o is one fiftieth of 360o, the distance from Alexandria to Assouan must be one fiftieth of the circumference of the Earth. Therefore, the circumference of the Earth, according to Eratosthenes, must be 50 x 580, that is 29000 statute miles. The latest measurements show that the correct distance from Alexandria to Assouan is 500 miles and if Eratosthenes had known this, the result of his calculation of the Earth’s circumference would have been: 50 x 500 = 25000 statute miles. Eratosthenes believed that the Earth is a perfect sphere and the above calculations were based on that assumption. However, we now know that the Earth is in fact an oblate spheroid (i.e. it bulges at the Equator). For this reason, there can be no single value for its circumference but the value generally accepted as its mean circumference is 24825.8 statute miles and when we consider that this measurement was made with the use of modern technology, it is quite remarkable that it is not too far removed from the findings of Eratosthenes whose only form of technology was the ‘shadow stick’. 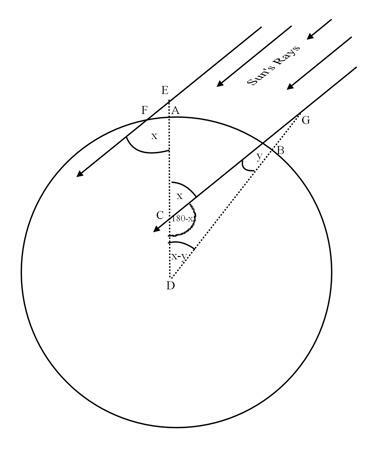 Eratosthenes’ Proof To Support His Calculation Of The Circumference of the Earth. Point D represents the Earths centre. x represent the angle made by the Sun’s rays and a stick at point A.
y represent the angle made by the Sun’s rays and a stick at point B. Angle FEA = angle ECG (alternate angles). → arc AB subtends angle (x – y) at the Earth’s centre. = 360 x 580 ÷ 7.2 miles = 29000 miles (statute miles).